The Disability Benefits Reform Act of 1984 (P.L. 98-460) was a set of reforms designed to pull-back on some of the perceived excesses of the Continuing Disability Reviews undertaken by the Social Security Administration in the wake of the mandates in the 1980 Social Security Amendments. H.R. 3755 was reported to the House as a Committee Bill from the Ways and Means Committee on March 14, 1984, the House past the bill on March 27th by a vote of 410 to 1 (with 22 Not Voting). 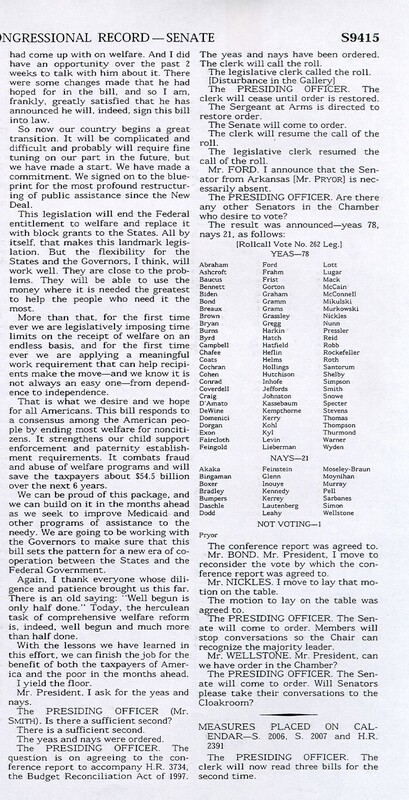 On May 15, 1984 the Senate Finance Committee began its mark-up of its own version of the bill (S. 476) which was introduced in the Senate on May 22, 1984 and which passed the Senate that same day on a vote of 96 Yeas and 4 Not Voting. The Conference Report (Report 98-1039) was introduced in both houses on September 19, 1984 and passed both that same day, by the recorded votes indicated below. The legislation was signed into law by President Reagan on October 9, 1984.